Roaches Everywhere? Let Us Get Rid of Them! Have you recently turned on the kitchen light and found roaches running for cover? Maybe you found a roach in a shoe or noticed one crawling across the living room floor while you were trying to watch television. 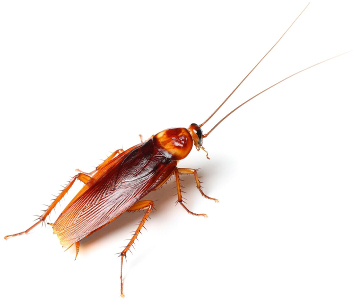 Whenever you see any type of roach, it’s time to call an expert and arrange for some kind of roaches control treatments. With the right type of cockroach control, your home will soon be free of any of these pests and you can relax once again. Getting an infestation under control is important for several reasons. One has to do with the potential health hazards to everyone living in the home. Roaches can carry a number of bacteria that leads to the development of serious ailments. Some may pass after a time, such as food poisoning. Others can linger as long as the roaches are in the home. Along with health issues, choosing to not do anything about cockroach pest control can mean damage to some of your prized possessions. Roaches tend to feed on books as well as the materials used to make book bindings. If you have volumes that mean a great deal to you, they could be destroyed. Your best bet is to contact a cockroach exterminator at the first sign of trouble. There are several signs that you have cockroaches in the home. Tiny droppings that appear to be dots of dust are often present. You may find that some of the paper packaging in your cupboard or pantry shows signs of being bitten. Roaches also tend to leave an odor in the home that is subtle but seems to be present no matter how much you clean. Finding the occasional dead roach is proof there are plenty more somewhere in the home. If you see any of these signs, it’s time to talk with a professional about what sort of cockroach removal treatment is right for your home. You may have more than one type of cockroach in the home. Some types will live in the space while occupying different areas. Before any efforts toward roaches removal begins, it pays to know what sort of infestation is present. While there are more than 4,500 types of roaches in the world, North America is home to around 70 varieties. Roughly a half-dozen are possible candidates for home infestations. German cockroaches are among the most common. Light brown in color, these are capable of sharing space with other roach types. They have one of the highest reproduction rates of any cockroach variety. All that is needed is a single female and one partner to produce over 30,000 roaches in the course of a year. They tend to be found in damper areas like cellars, under the sink and in the bathroom. Brown band cockroaches prefer drier spaces and are likely to get into your electronics, the carpeting, and the bedding. They are usually brown with golden or tan tips on the wings. There may also be light yellow bands on the bodies. These roaches can easily co-exist with the German roaches since they are attracted to the drier parts of the house. While less prolific in terms of reproduction, they tend to move fast and love to get into dry foodstuffs. Cockroaches look for shelter and food. Meats, cheeses, breads, and sugar are among their favorites. Any tiny crumbs that are left out will be sure to attract attention. Some varieties will seek warm and dry areas of the house, like the space underneath your clothes dryer. Others will prefer damper spaces, like behind the water heater or near plumbing. Regular cleaning helps eliminate some of the things that attract cockroaches. You can also engage in cockroach prevention by blocking points of entry. That includes tiny openings in window screens, cracks around the home’s foundation, and open spaces under exterior doors. You can use sprays from a local store, but that will only address part of the problem. A true infestation can only be managed with the aid of professional cockroach treatment. An expert will know where to administer treatments that get rid of everything. That includes the cockroaches that are in the home and are never seen by you or anyone else. There’s no reason to live with any type of roaches in your home. Call Responders Pest Control today at (604) 757-1000 and let us get rid of the problem. If you like, contact us via the request form found on our website. We offer cockroach control in Okanagan Valley, Kamloops area, Vancouver and the Lower Mainland for our customers’ convenience. Once we finish with the job, you can rest easy knowing your home is pest free.